Are you a parent, caregiver,foster parent, or a teenager with special needs and are seeking support? 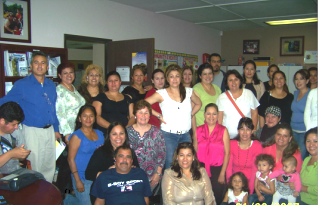 If so, Parents' Place offers a variety of parent support groups that may meet your needs. The support groups provide support in the following areas: English, Spanish, Fathers', Down Syndrome, Mandarin/Cantonese, and Teens. See the support group information below. If you would like to attend a support group, fill out the questionnaire below. There is no cost to attend and child care is available. Once you enter your information, you will be immediately be notified that your information has been submitted. If you have any questions feel free to email us at empower@parentsplacefrc.com or call us at 626.919.1091. Thank you! Raising a child or young adult with special needs is much like riding a roller coaster. As parents, we have our low times, but we have our good times, too. Though special events need to be celebrated, enjoyed and shared with other, low times need to be shared as well. Those "low times" are when we need understanding and support the most. ﻿Every teen needs a great group of friends and a place to hang out. Teen Titans offers teens with special needs a safe/welcoming environment to make new friends, hang out and have fun. This group is intended for teens age 13-17 with mild to moderate special needs. The group meets at Parents' Place and various off-site locations for fun activities. ﻿﻿﻿﻿﻿﻿Spanish support group. Críar a un niño con necesidades especiales es parecido a subirse a una monataña rusa.Como padres podemos subir hasta lo mas alto de la montaña con los recuerdos de los buenos momentos, pero tambien, nos podemos hundir hasta lo mas bajo con los tiempos no tan buenos. Los invitamos a participar y compartir sus experencias, herramientas y aprender de otros padres sobre la cianza de niños entre los 0-22 años de edad. ﻿﻿DAD Rocks, a fathers’ support group, meets on a monthly basis, for both English and Spanish-speaking fathers. The group will be led by fathers and attended by fathers, and we welcome all fathers, no matter how mild or severe your need may seem. So don't be shy. Visit us soon. We invite you to participate in this support group designed for parents and caregivers who speak Mandarin/Cantonese and are raising a child or children with special needs. Feel welcomed to share your experience, tools, and learn from other parents raising a child or children with special needs.